Celebrate sun-filled days with this theme’s outdoor activities, crafts, a new song, culinary activities, and so much more! Activity sheets, word flashcards, a sequential story, counting cards, photo booth accessories, and many other sunny documents to explore. 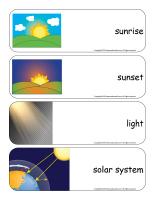 (Open educa-theme-Sunshine) Print and laminate the different elements representing the theme. Use them to present the theme to your group (and their parents) while decorating your daycare. 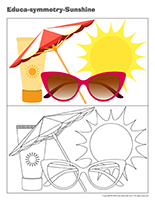 (Open educa-decorate-Sunshine) Print, laminate, and cut out the illustrations. Use them to decorate your walls and set the mood for the theme. 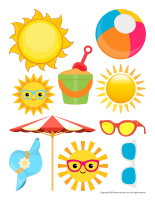 (Open stickers-Sunshine) Print on adhesive paper and use the stickers for various projects throughout the theme. Invite children to draw suns and cut them out. Using colorful clothespins, they can hang them on your clothesline. If you wish, children can continue to add to your clothesline throughout the theme. (Open models-Sun) Print and let children decorate the items. Cut them out and use them to create a garland that can be hung within your daycare or near your daycare entrance. Press glow-in-the-dark suns (or other fun shapes) on your daycare ceiling. Children will enjoy looking at their sun-filled “sky” during circle time and at naptime. Admiring the shapes may even help them relax and fall asleep. Create a fascinating centerpiece by inserting a set of small yellow Christmas lights in a clear container. (Open weather wheel) Print, laminate, and display in your daycare. Daily, name a child who will be the group’s meteorologist. This child will be responsible for the weather wheel. 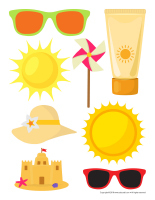 Discuss the weather and, as a group, determine which pictograms the arrows should point to. If sun and rain are both present on the same day, use both arrows. Otherwise, both arrows can be placed one on top of the other and point to the same pictogram. Gather several objects associated with different seasons and ask children to identify the season in which each item is used. Ask them questions about each of the four seasons. For example, ask them about the weather and temperature that can be expected, which sports and activities can be enjoyed outside, which changes can be observed in nature, which means of transportation can be used, etc. Set several objects that light up in the center of your circle time area: a cell phone, a lightbulb, a flashlight, a candle, etc. Show children, for example, a picture of a flame. Encourage them to identify the object that produces a flame. Talk about things that produce light with your group (lightbulbs, candles, fire, etc.). (Open picture game-Sunshine) Print and laminate the pictures in the format you prefer. Use them to spark a conversation with your group. Ask children questions about the sun. (Open Poni discovers and presents-Sunshine) Print the cards. Laminate and cut them out. Use your Poni puppet (or another puppet children are familiar with) to present them to your group. (Open picture game-Sunshine) Print and laminate the pictures in the format you prefer. Use a hole-punch to make a hole in the upper right and left corner of each picture. Stack the pictures and insert a ring through each set of holes. The flipogram is easy to manipulate. Simply show children how they can lift a picture and flip it under the stack. Name each item with your group. Use the flipogram to encourage children to talk during circle time and to ask them questions about the theme. The pictures may be used as a memory game or to spark a conversation with the group. Use them to decorate the daycare or a specific thematic corner. 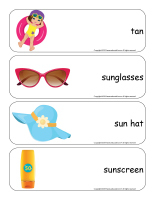 (Open picture game-Sunshine) Print, laminate, and store in a “Ziploc” bag or in your thematic bins. 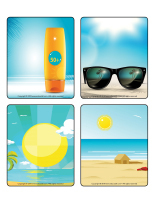 (Open picture game-Sunshine) Print the pictures twice and use them for a memory game. 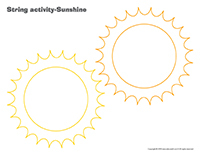 (Open activity sheets-Sunshine) Print and follow instructions. 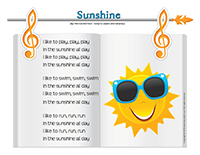 (Open writing activities-S like sunshine) Print for each child or laminate for use with a dry-erase marker. (Open educa-spots-Sunshine) Print for each child. Use bingo markers to add a touch of color inside each circle. If you don’t have bingo markers, simply ask children to set Cheerios or press a sticker inside each circle. 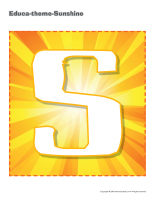 (Open word flashcards-Sunshine) (Open giant word flashcards-Sunshine) Print several word flashcards. Glue them on pieces of paper, laminate them, and arrange them in a binder. Show children how they can trace the words using dry-erase markers. If you wish, leave room under each word so children can try to write the words without tracing the letters. (Open stationery-Sunshine) Print. Use the stationery to communicate with parents, in your writing area, or to identify your thematic bins. (Open educa-nuudles-Sunshine) Print for each child. Have children color the sheet and use Magic Nuudles to give it a three-dimensional look. Variation: You don’t have Magic Nuudles? Have children fill the spaces designed for Magic Nuudles with bingo markers or stickers. To order Magic Nuudles. 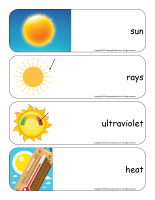 (Open word flashcards-Sunshine) (Open giant word flashcards-Sunshine) Print and laminate the word flashcards. Have each child pick a word and present it to the group (ex. sunglasses). Ask them questions to see what they know about the theme. 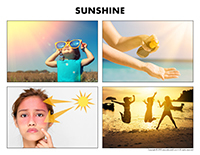 (Open word flashcards-Sunshine) (Open giant word flashcards-Sunshine) Print two copies of several different word flashcards. On a large piece of cardboard, stick one copy of each flashcard vertically to create a word column. Cut the second copy of each word flashcard so you have the word on one side and the illustration on the other side. Attach Velcro behind each part as well as to the right of the uncut flashcards (on the cardboard). Arrange the cut flashcards on the table and encourage children to look at your flashcard board to identify a matching word and illustration. When they succeed, they may stick them next to the corresponding flashcard, on your board. This exercise will help children associate words with pictures. 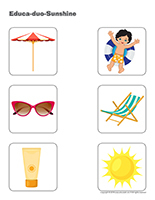 (Open word flashcards-Sunshine) (Open giant word flashcards-Sunshine) Print several word flashcards. Use a hole-punch to make a hole at the top of each flashcard. Thread a ribbon through each hole and tie a knot. Bring the word flashcards outside and encourage children to use them to decorate a tree. Every time a child adds a flashcard, invite him/her to “read” the corresponding word. Children will be happy to repeat this activity many times. Eventually, they will learn to recognize the words. 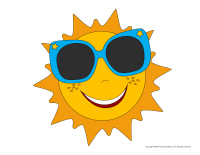 (Open word flashcards-Sunshine) (Open giant word flashcards-Sunshine) Print two copies of several word flashcards. Hang one copy of each word on an indoor clothesline with colourful clothespins. Arrange the copies in a pile on a table. Let children take turns picking a word and finding the matching word on the clothesline. When they find a match, they can place the flashcard on top of the one that was already hanging on the clothesline. Help younger children manipulate the clothespins if necessary. 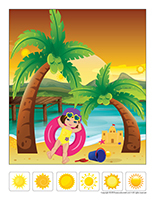 (Open story and memory game-Sunshine) Print, laminate, and cut out the illustrations. Set them face down on a table or on the floor. Children take turns picking three cards and inventing a story in relation to the illustrations. Trick: To solidify the cards, glue them on the tops of frozen juice cans. 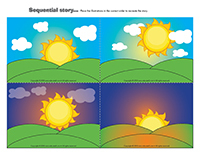 (Open sequential story-Sunshine) Print and laminate. 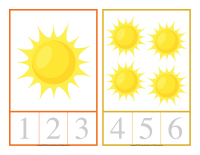 Invite children to arrange the illustrations in the correct order to represent the Sun’s movement from sunrise to sunset. Turn all the lights off. Using a flashlight, project light on the floor, moving it around in every direction. Children must try to step on the ray of light or catch it with their hands. Use two flashlights if necessary, for example if you have a larger group. (Open models-sun) Print. Laminate the illustrations and arrange them on the floor. Play music. Every time the music stops, children must quickly find a sun to sit on (variation of musical chairs). Set a small battery-operated light in a clear plastic container for each child. Have children add strips of white tissue paper to their container. Turn all your daycare lights off and invite children to walk around the room, holding their torch up to see where they are going. Invite children to stand around your parachute. Each child holds a handle. Turn all your daycare lights off to make the room as dark as possible. Set several glowstick-type bracelets and necklaces as well as other luminescent items on your parachute. When you give the signal, children lift the parachute high over their heads. As the lit items fall to the ground, children hurry to collect them. Count how many each child collected. Repeat. This is in fact a cat and mouse game involving your parachute. However, it is modified since it is played in the dark. Have your group sit around your parachute, holding the handles. They can gently move the parachute up and down, creating wave-like movement. One child will play the role of the cat. Have him crawl around, on top of the parachute. Invite another child to play the role of the mouse. He crawls around under the parachute, holding a flashlight (or wearing a few glowstick-type bracelets on his arm). The cat must follow the light to catch the mouse. Make your daycare as dark as possible to represent night-time. In one corner of your daycare, set up a flashlight (or another light source). One child becomes the leader of the game and stands facing the light. The other players stand on a line, a few meters behind him. The leader of the game says, “1, 2, 3…sun!” As the leader of the game counts, the other children move towards him. When the leader of the game says “sun”, he quickly turns around and the other players must stop in their tracks. If a child moves, he becomes the leader of the game for the next round. Give each child a flashlight. Turn all the lights off in your daycare. Make the room as dark as possible. Children walk around the room observing objects with their flashlight. Inflate several balloons and insert a battery-operated tealight in each one before knotting them. Turn the lights off and let children have fun tossing the balloons up in the air. Variation: Insert glowsticks in the balloons instead of tealights. Close your daycare curtains and lights to make the room as dark as possible. Create an obstacle course and hang colorful glowsticks from the various obstacles. As children complete the obstacle course, they must collect one glowstick of each color. At the end of the course, they can assemble them end to end to create a circle of light. You can purchase glowsticks at your local dollar store. For this activity use glowstick bracelets. Form a circle and invite children to hold hands. When you give the signal, pick a child who must squeeze the hand of the child to his right who must in turn squeeze the hand of the child to his right and so on. When the first child’s left hand is squeezed, he must shout “sunburn”. Use yarn or string to represent rays. Children can simply toss the ball of yarn or string around, from one child to another. Use this activity to explain to your group how the Sun’s rays generate heat. 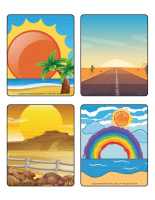 (Open counting cards-Sunshine) Print and laminate. Prepare a series of wooden clothespins on which you have written or painted numbers 1-9. Children must count the items on each card and place the corresponding clothespin on the correct number. (Open roll and color-Sunshine) Print for each child. This game can be enjoyed individually or as a group. Children take turns rolling a die, counting the dots, and coloring the corresponding part. Use this theme to explore yellow. Plan a treasure hunt using all the yellow items you have in your daycare. Have children collect all the yellow things they see and set them in a box. When they are done, name the objects together and help them recognize how the items are all yellow…like the sun. 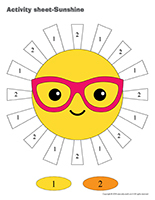 (Open string activities-Sunshine) Print for each child. Children trace the lines with waxed string pieces (Wikki Stix). Variation: Trace the lines with glue and press string on the glue-covered lines. Wikki Stix are sold on the educatall online store. 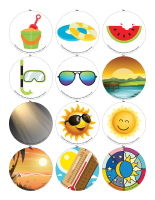 (Open educa-duo-Sunshine) Print and laminate for durable, eco-friendly use. Children must draw a line between the items which go together using a dry-erase marker. (Open educa-symmetry-Sunshine) Print. Children must color the bottom picture using the same colors seen in the top picture. (Open educ-intruder-Sunshine) Print and laminate. Children must search for the six items shown at the bottom of the page in the scene. 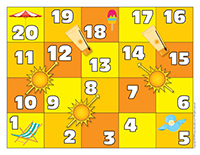 (Open snakes & ladders-Sunshine) Print and laminate. Use a die and tiny battery-operated tealights as playing pieces. Each child must reach the final square. (Open you are my sunshine) Print. Color the document with your group if you wish. Cut out the suns. Hang a clothesline within your daycare. Set the suns, clothespins, and crayons next to your clothesline. Write the name of a child, parent, or early childhood educator on each sun. Use a clothespin to hang each sun on your clothesline. (Open photo booth-Sunshine) Print the accessories. Cut them out and stick a drinking straw behind each one. At your local dollar store, purchase additional accessories such as sun hats, beach towels, sunglasses, etc. to complete your photo booth. Set up a special corner by hanging a piece of fabric, a large cardboard background, or a special sunny décor. Let children choose the accessories they prefer and photograph them. Invite parents to have fun with your photo booth too. Print and display the pictures. They will represent great souvenirs. 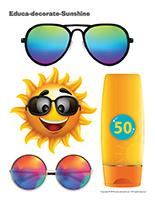 To celebrate the Sun, fill a large container with a variety of colorful sunglasses. Parents will be happy to share old sunglasses they have at home with you. Have fun trying them on in front of a mirror with your group. 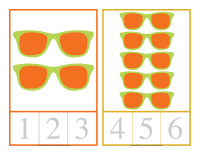 Every time you go outside, invite children to pick a pair of sunglasses. Let them wear the sunglasses outdoors. Have a child hide with a drum in a dark room. When you give the signal, the other children search for him with flashlights. Every now and then, the child who is hiding can tap the drum to help the others find him. Give each child half of a peach (sun) in a bowl. Garnish each peach half with cottage cheese (clouds). Enjoy this treat at snack time. You will need orange slices, carrot sticks, and grapes to prepare this snack. Each child can set an orange slice in the center of his plate to represent the center of the sun. Have children arrange carrot sticks all the way around their orange slice to represent rays. Help them cut a few grapes in half. They can use them to represent eyes, a nose, and a mouth. Set a flashlight on a table. Deposit an object in front of the light beam. The light will project the object’s outline on the wall. Stick a large piece of paper on the wall and encourage children to trace the contour of the object. (Open sunny stained glass) Print on heavy paper. Cut out the centre of the shape using an X-ACTO knife. Have children cut pieces of colorful cellophane paper they can glue on their stained glass. Once all the sections have been filled, display their work in a window. 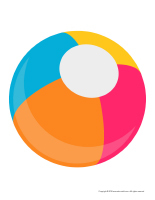 (Open models-Sun) Print the models and use them for various crafts and activities throughout the theme. (Open puppets-Sunshine) Print the various models on cardboard. Ask children to cut them out and decorate them with arts & crafts materials. Glue a Popsicle stick behind each one to complete the puppets. Give each child a paper plate and have them paint it using yellow, orange, and red poster paint. Children can cut rays out of construction paper and glue them around their plate to compete their sun. Older children can help little ones with the cutting part of this project. (Open craft-sun) Print and glue on heavy cardboard. Fill the shape with glue. Crumple tiny pieces of yellow tissue paper and let children glue them on their sun. (Open models-Sun) Print a sun for each child. Have them color their sun and glue it on orange construction paper. Help children cut out their sun. Hang their work from the ceiling using invisible thread. (Open sun clock) Print and cut out the pieces. Give each child a paper plate and ask them to glue the numbers around the clock. Make sure they place the “12” at the top and the “6” at the bottom. Make a small hole in the center of the plate. Use a fastener to hold the hands in place. For the contour (sun’s rays), trace the outline of children’s hands several times on yellow construction paper. Have them cut them out and glue them around the plate, with the fingers pointing out. (Open coloring pages theme-Sunshine) Print for each child. (Open songs & rhymes-Sunshine) Print.